Even as cloud computing becomes must-have, must-use technology for corporations worldwide, Cray and other builders of supercomputers are finding businesses to be a receptive market for their products. For PGS, an oil-imaging company in Oslo, Norway, finding pockets of oil and natural gas in the ground essentially starts by taking a large ultrasound picture of Earth. PGS, short for Petroleum Geo-Services, this year tried to speed up that work by buying a supercomputer built by Seattle-based Cray. The computer, housed in several pantrylike cabinets, takes PGS’ massive library of images and data, and applies algorithms to get crystal-clear pictures that speed the complex task of finding oil. Founded: 1972 in Chippewa Falls, Wis.
PGS is one of the several businesses that have been buying Cray’s supercomputers, a shift for a company that has traditionally sold to government agencies and academic institutions. Cray says 15 percent of its revenue last year, expected to fall between $720 million and $725 million, came from sales to businesses. That’s double the percentage from 2014. 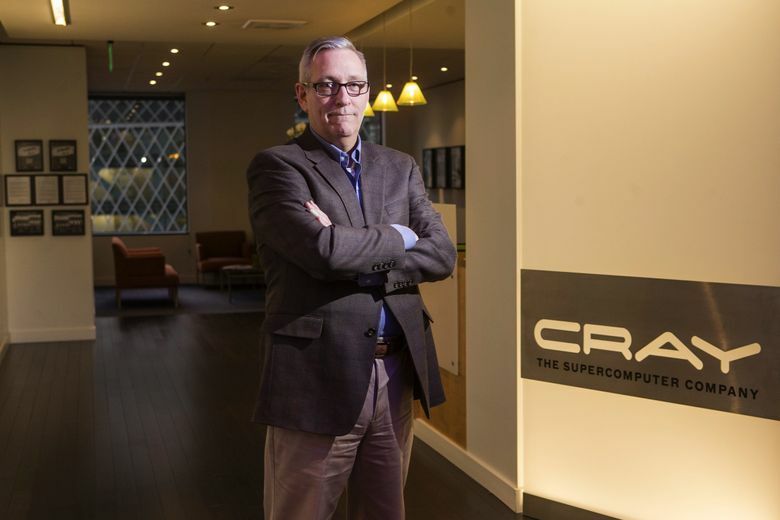 Cray’s shift comes at a time when demand for cloud computing — which allows businesses access to greatly expanded computing power — is rising as corporate big-data needs increase. But demand for supercomputers is also strong; the massive pieces of technology do some things that the cloud just can’t. Cray isn’t alone in this. At IBM, sales grew last year for just one of its more than a dozen lines of business, according to estimates by investment bank UBS. That would be mainframes, the giant computers with tons of processing power that Big Blue has been selling for decades. Sales by IBM’s System Z unit soared 30 percent, to $2.8 billion, UBS estimates. 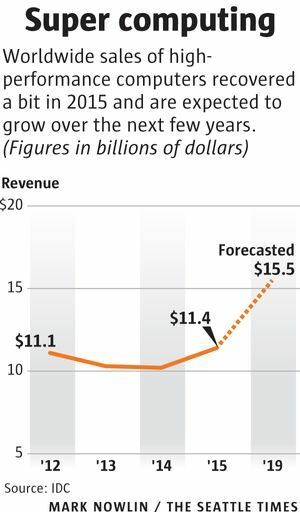 Market-research firm IDC says sales of high-performance computers reached $10.22 billion in 2014 and estimates the market will grow 8.6 percent a year in the following 5 years, topping $15 billion in 2019. The uptick in sales of giant computers by Cray, IBM and others bucks decades of struggles to compete with smaller computers and the cloud. It’s also a reminder that established technologies sometimes show surprising staying power in the face of rapid change. The history of technology is largely a story of new innovations competing to elbow out the old. Personal computers were the death knell for the typewriter. The iPhone started a wave of change that would dethrone cellular-phone giants Nokia and BlackBerry. The Seattle area, home to Amazon Web Services and Microsoft’s Azure platform, is the epicenter of what technology analysts say is a once-in-a-generation shift in how people and businesses deal with their digital goods. But that move toward cloud computing, or using giant data centers to store data and run software programs, hasn’t spelled the end of the line for the business of selling refrigerator-sized computers. Many buyers of mainframes or other high-performance computers belong to industries like insurance or finance. Because of regulatory or other restrictions on how they use data, they tend to remain plugged in to powerful computers they own and operate themselves. In other cases, complicated software developed over decades would be tough to rework for the cloud. That includes things like airline-reservation systems or complex logistics and scheduling software for railroads or utilities. “There are a lot of applications running on mainframes that have been there for a long time and are hard to move,” said Mark Russinovich, chief technology officer of Microsoft’s Azure unit. 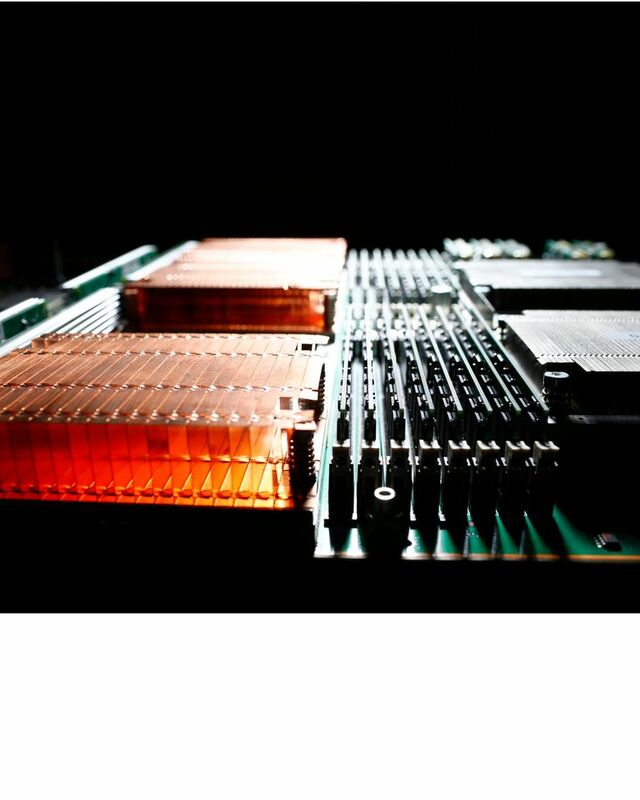 Microsoft and rival Amazon.com are introducing increasingly powerful computers that customers can rent, but analysts say high-performance computers can clear technical hurdles that most “public clouds” of pooled servers can’t. Steve Conway, an analyst with IDC, said the cloud is great at simpler technical problems. But supercomputers are often needed for complex problems where one small design change may have a ripple effect that changes 50 other inputs and everything needs to be calibrated as one, he said. “Calculation that takes everything into consideration at the same time takes a hell of a lot of computing power,” Conway said. Supercomputers are used across industries. They aren’t just for heavy players in the auto and manufacturing businesses. Companies use them for designing a Pringles can so that chips can soar into the air and back into the can. Or they’re used to create a diaper that absorbs properly but also has its many tabs in all the right places. Golf-equipment manufacturer Ping is using the technology to make golf clubs. “What’s good technology for designing a space shuttle turns out to be good for a golf company,” Conway said. In many cases, though, the question of whether to use such proprietary servers or cloud-based services isn’t an either-or proposition. Rick Arthur, director of advanced computing at GE Research, said the company uses supercomputers in many stages of its design process to examine “overwhelmingly complex” data and make sense of it. It also uses the cloud. “If you have a cloud plus this secret sauce of a supercomputer behind it, you can now do things that are not possible” for someone relying on Amazon or Microsoft alone, he said. However, many analysts and industry insiders expect most businesses and government entities to increasingly rely on the cloud for most tasks. “The whole industry should be going to the cloud,” Dillenberger, with IBM, said. “It’s more efficient.” In addition to selling and leasing its mainframes, IBM rents their processing power in its own cloud services. Microsoft’s Russinovich said the technical barriers and businesses’ wariness of the cloud are both eroding. “I think all of these blockers will be addressed over time,” he said. Commercial companies have used supercomputers for decades. But as costs for the technology come down and the amount of data companies collect rises, Cray sees an opportunity to make a splash across industries. The company sold supercomputers to businesses across five industries in 2015, including financial services, manufacturing and life sciences. Corporations may buy the same type of computer as a $100 million model that goes to a government agency, but the company’s model may cost a few hundred thousand dollars. The trade-off is less computing power. Cray, said Chief Strategy Officer Barry Bolding, is moving “away from being exclusively a provider to big government.” For the company, which employs 150 people in Washington and 1,270 worldwide, targeting commercial buyers is something of a blast from the past. The company sold the first supercomputer to the auto industry in 1979. But more recently, the majority of the company’s sales targeted government clients. Cray itself is emerging from the bumpy road of corporate deal making in the 1990s that saw the company change hands twice in four years and a corporate cousin go bankrupt. That ended in 2000 when the Cray Research division was acquired by Seattle-based Tera Computing, and renamed itself Cray.